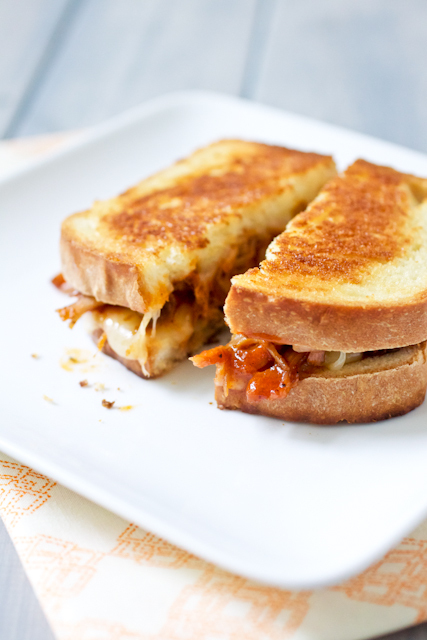 These bbq pulled pork grilled cheese sandwiches are a phenomenal way to use up leftover pulled pork! I love lazy weekends where anything is possible. Breakfast at the diner? OK. Fussing in the garden? I’ll take it. A whirl around the gym? Only because I have to. Making grilled cheese for lunch? You betcha! (Hence the time at the gym.) 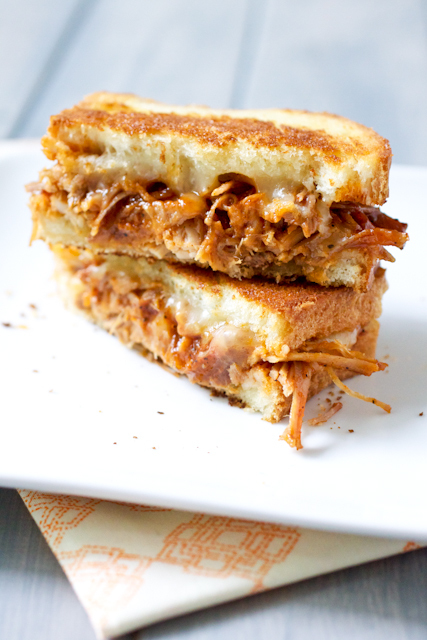 These bbq pulled pork grilled cheese sandwiches were a creation I had been dreaming of since the pork shoulder went in the oven a few weeks ago. I had also planned on making taquitos with the leftovers but sadly, the leftovers never made it that far. Anyway, perfectly buttered and toasted white bread hold together this magnificent sandwich combination. The Monterey Jack melts into the pulled pork just as it should, leaving you with sandwiches that you’ll wish there were more of (though one certainly was plenty for lunch for us). I decided to toast all of the bread slices independently and to cover the pan to allow the cheese to melt before combining the halves because all too often, when grilled cheese sandwiches have a lot going on inside, the cheese doesn’t melt completely. Problem solved. And? The perfect weekend lunch. As with most grilled cheese sandwiches, the bread you use makes all the difference. Because these sandwiches have the tendency to be on the messy side, choose a hearty white bread that can stand up to the awesomeness within; thick-sliced country white or homemade white bread are excellent choices. I didn’t think of this when making these sandwiches, but if you love red onion like we do, thinly sliced onions would be an excellent addition to this sandwich, as would sliced pickled jalapenos if you’re looking for a little extra bite. Heat a large non-stick skillet over medium heat. Butter one side of all of the bread and place the butter side down in the skillet. Divide the cheese between all of the slices and top the cheese on just of the two slices with the pulled pork. Cover the pan with a lid or sheet of aluminum foil for about 3 minutes; this will ensure heat melts the cheese and heats the pork through. Remove the lid (or foil) and check the undersides of the bread with a spatula. If all of the slices are lightly browned, flip the slices with the cheese onto the pulled pork so the cheese and pork can meld together. After 30 seconds to 1 minute, flip the sandwiches to finish off the other sides. When both sides of the sandwiches are perfectly browned (you know what that looks like) and the cheese is fully melted, remove them from the pan, cut, and serve hot and gooey. Copyright Smells Like Home. Please provide a link to this recipe should you share your version online or in print. Wow..This looks delicious! Very cool idea to combine those two dishes together. I am drooling thinking about them! these look awesome! almost like a patty or frisco melt, except even better! Whoa… this looks incredible! Maybe it’s just that it’s 2:30 and I haven’t eaten lunch yet, but my mouth is watering and I am suddenly inspired to run out for something delicious like this. and I agree… I bet some onions would be killer on this sandwich! You can’t beat grilled cheese. It is just so comfy. They fit like sweat pants. (I mean that in a good way) this version looks incredible! I will definitely try it out! Oh gracious mercy me! I just discovered this lovely blog, and this is the first entry I come across — I’m hooked, and can’t wait to try this! Oh My! This is the perfect comfort food sandwich if I’ve ever heard of one. I can’t wait to make it. More than that – I can’t wait to eat it! Just found this blog…. this looks delish my family will love this… I’ll be making it verrrry soon.